Beachy Head is a picturesque white chalk cliff which is located near the Eastbourne of Susses, England. 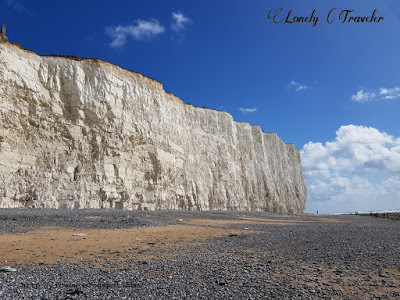 UK has several chalk cliffs and this one is the highest one having 531 feet elevation from the sea level. Being a vast area this place remains open 24 hours for the visitors (except the visitor center). Most of the tourists use to have a walk between the lighthouse to the Birling Gap. The distance between the two places are approximately 3 miles. 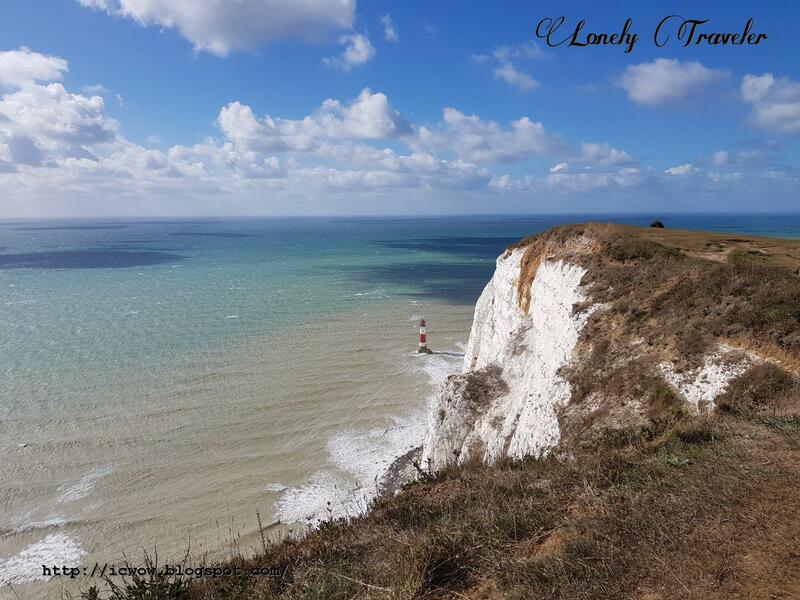 Depending upon your choice you could start the Beachy Head walk from either of the places. It was a very windy but bright and sunny day. Beachy Head had appeared in several famous movies and TV series. For example the The Living Daylights (of James Bond), Harry Potter and the Goblet of Fire, TV series Black Mirror - Be Right Back, etc. 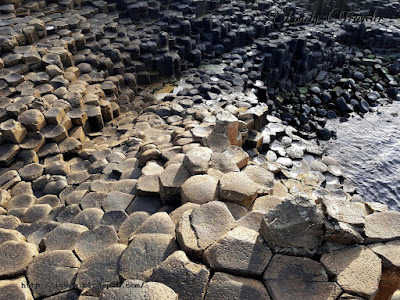 Being a beautiful natural wonder as well as famous, this place attracts plenty of visitors each year from both UK and outside. It was very green and the clouds were very close to us. We've started our day from Eastbourne by taking the sight seeing tour bus. The cost of the bus was 10 pound per person with a validity of 24 hours. That bus dropped us near the Beachy head (more preciously the Beachy head pub bus stoppage). From there we've started walking towards the Birling Gap. The day was very bright and sunny. But the wind was very heavy as the storm Bronagh did hit last night. We were walking against the wind. And the wind was so heavy that it reduced 1 tenth of our normal walking speed. Even the water around the cliff were colorful too. During our hiking first we've explored the Beachy Head lighthouse, obviously from the top of the cliff. There weren't any path that would lead us to the lighthouse. The red lighthouse was giving a nice combination with the white cliffs. FYI, the construction of this lighthouse begun during 1831. After taking few photo of the lighthouse and chalk cliff we've started walking again through the beautiful terrain land. The left side of us were the beautiful cliff and ocean. 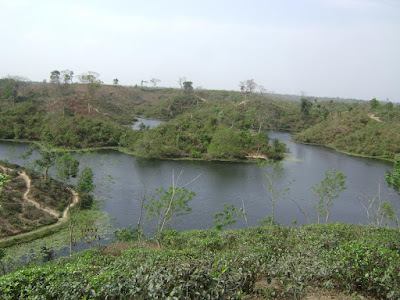 And the right side was having the wide English farms which were tremendously beautiful too. We've just started walking, still a long way to go. There were plenty of tourist walking around us too. Most of them were overtaking us as they were having more pace then us. Also we were taking plenty of stops to look around more thoroughly then others. 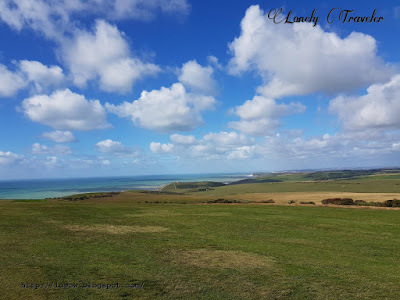 We had to pass beside the Belle Tout lighthouse as we were walking towards the west. That lighthouse is inside the private property. That's why we couldn't go inside. It appears that the premise has a guest house. It would be a nice idea if you book such one early and stay there during the full moon night. Lighthouse with the cliff of Beachy Head. Before reaching the Birling Gap we've had a glimpse of the Seven sisters cliffs. 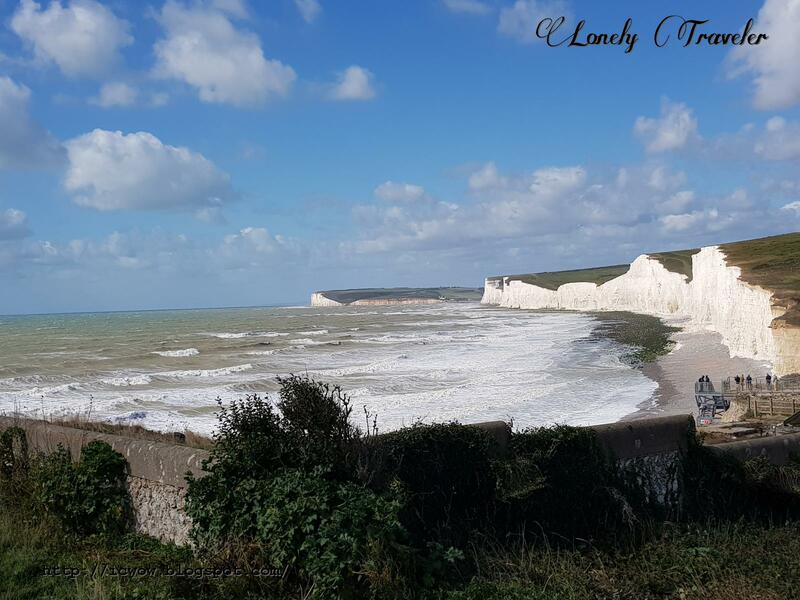 Birling Gap is at the middle of the Beachy Head and the Seven sisters country park. There has a visitor information center along with coffee shop and a toilet. People could park their cars there too. Most of the tour buses park their vehicle there to allow the tourists to explore the area. The hop-on hop-off bus from Eastbourne has a stoppage here too. If anyone wants to skip the walking from the Beachy Head lighthouse could take this stoppage. Lighthouse and the Beachy Head cliffs. There is a stair which you could use to go to the beach at Birling Gap. 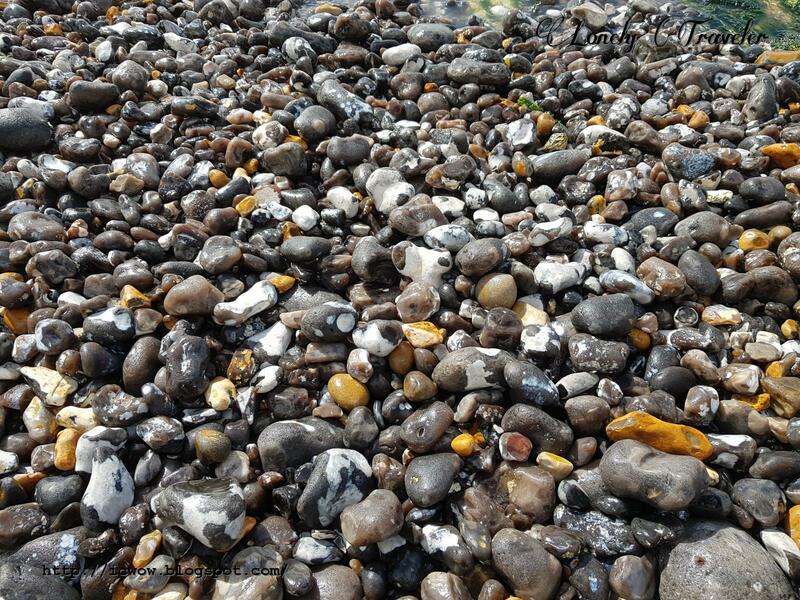 It was a marvelous pebble beach beneath the chalk cliffs. From the beach you would be able to see all the Seven sisters cliffs in one frame. We've gone there to roam around the beach. It was during the high tide time. 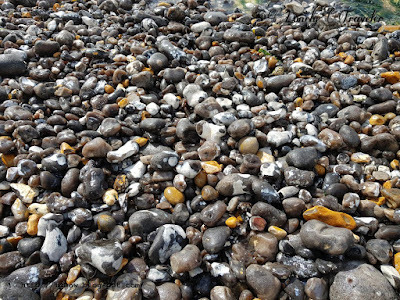 The pebbles were taking various color when the ocean water was soaking them. In some places the green weeds has grown over the rocks. They've formed a green shaped ball. I've seen such thing in several other places before. When they are wet they look very bright and colorful. If we had more time we would walk around the beach for few hours, but we didn't. Instead we just sat over the pebbles at the beach and enjoy the cliffs and the ocean for a while before leaving. There is another lighthouse seen at far sight (which is inside a private property). The Eastbourne sight seeing tour bus (known as Hop on Hop off) runs till the Birling Gap. If you don't want to walk then the bus is the option for you. After exploring the beach you could return using the same bus. Also if you like you could get off near the Beachy Head lighthouse and then start doing trekking till the Birling Gap. The bus costs 10 pound per person and the ticket is valid for 24 hours. Lot of people do starting their walking from the Eastbourne town too. That would be a hell of walking but worth trying if you are passionate about it. 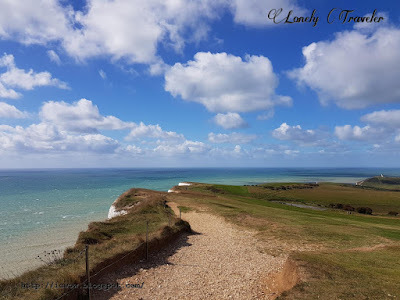 If you are bringing your car with you then there are several parking spots (paid I think) in several places such as Belle Tout, Beachy Head Inn, Birling Gap, etc. The roads were having ups and downs like this. 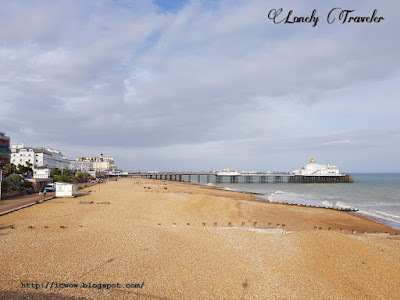 I've stayed in Eastbourne town as it has plenty of Victoria style hotels just beside the beach. I've stayed in the West Rocks Hotel for two nights there. It was nice old style hotel just beside the sea beach. You could look for more at this list of Eastbourne hotels. This is the road from where we've just come. 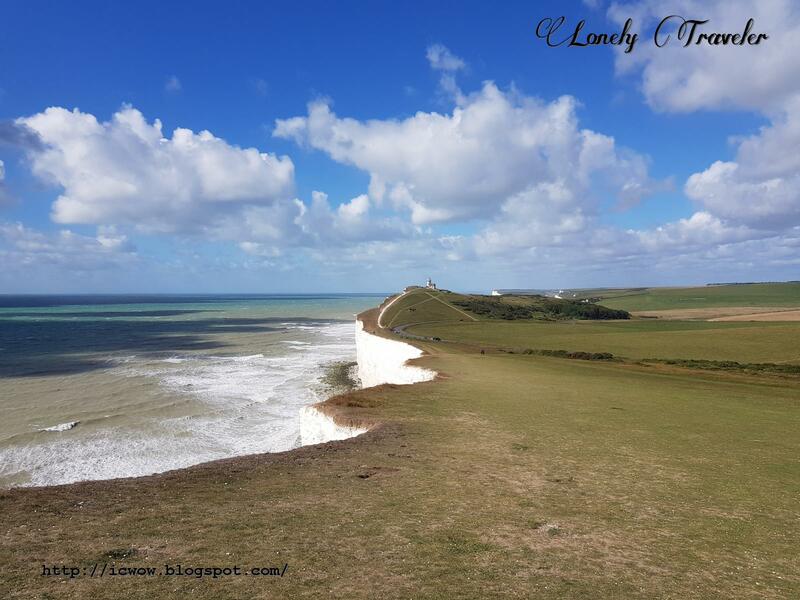 There is a restaurant available near the Beachy Head lighthouse. I think it is named as The Beachy Head. Also there is a coffee shop available at Birling Gap. You could have your snacks from either of the during your cliff walking. View of the lighthouse from another angle. The beach could be accessible through the stairs from the Birling Gap. You could start walking at the beach underneath the cliff. 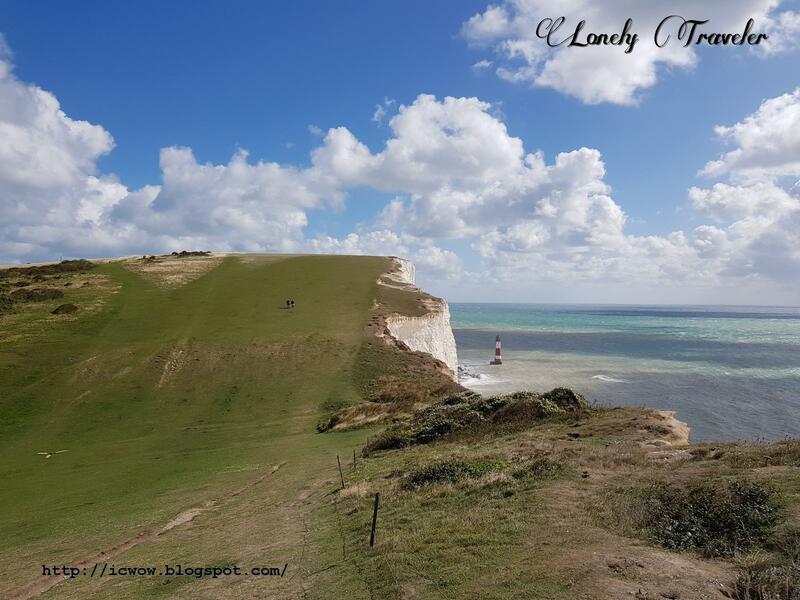 It is possible to walk towards the Beachy Head lighthouse through the beach. But you have to be very careful with the tide. If it is high tide then you would not be able to walk through that. That's why keep an eye on the tidal time. A lovely landscape during our cliff walking. The Sussex voyage used to run the service to facilitate the tourist to have a boat trip towards the lighthouse of Beachy Head. But the company is now in sale. That's why they are not running any trip in current days. It would be a nice idea to do the boat trip to have the lighthouse from a very close proximity. Look for other similar services (if there are any) which help to do that. There are several parking spaces near the cliff walking path. People can park there car. 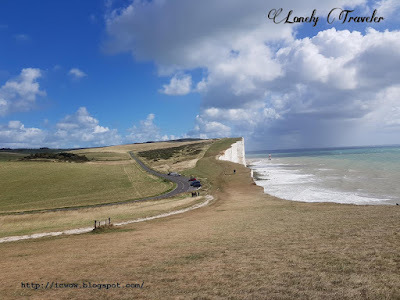 The Seven Sisters Country Park starts from the Birling Gap. 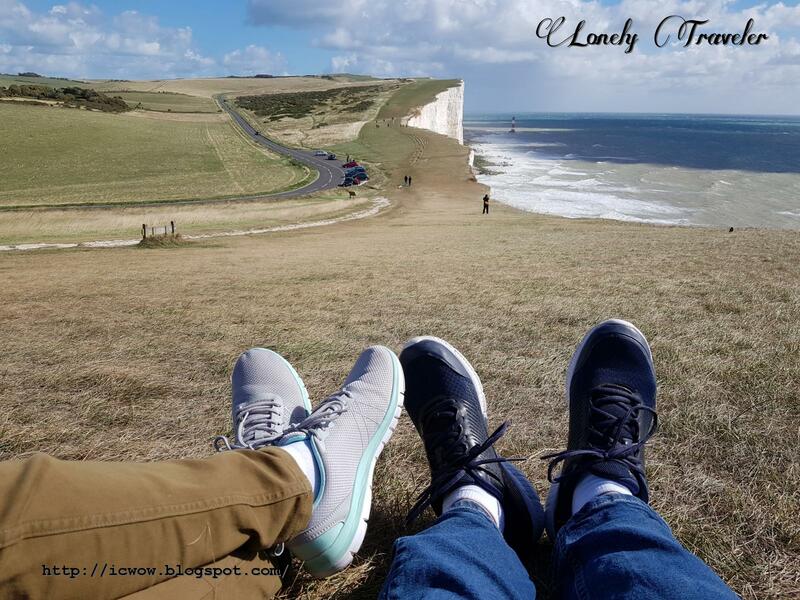 Instead of finishing your walking at there you could keep continuing your waling till the Seaford. After a long walk we were taking some rest and enjoying the beauty of the cliff. The Beachy Head cliff is not guarded. The edge of the cliff could be dangerous at some places. It could easily loose and anyone could drop from there. That's why it is always advised to stay in a safe distance from the edge of the cliff. Also the wind near the cliff could be heavy sometimes. During a windy day stay away from the edge of the cliff again. We were near to the Birling Gap. From here the path for Seven sisters park starts. View of the Seven sisters cliff from the Birling Gap. A closer look towards the chalk cliffs from the beach. Colorful stones and pebbles from the beach. Some sort of weeds are growing over the chalk stones in beach. These green weeds are giving the stones a very lively color.